The worth of apprenticeship programs in heightening skills in the workforce is receiving new attention, both nationally and in the Wheeling area, and West Virginia Northern Community College and numerous partners are meeting to plan ways to join forces to benefit employers and their workers. An Apprenticeship Core Group comprised of WVNCC officials; representatives of the Office of Apprenticeship, U.S. Department of Labor; and individuals from various construction trades, including plumbers and pipefitters, ironworkers, electricians and roofers, have met several times at the Wheeling campus. Meeting most recently on Nov. 3, the core group discussed further its initial plans to formulate an associate’s degree and a one-year certificate program that would use educational components of both the community college and the apprenticeship programs already in place to result in an academic degree or certification. 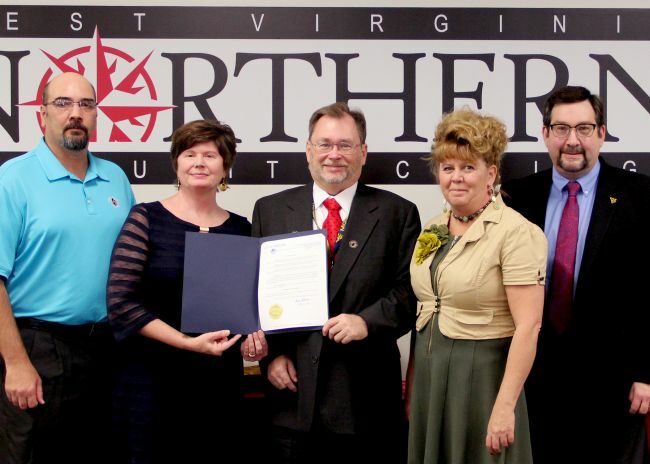 At that meeting, in addition, Dr. Vicki L. Riley, WVNCC president, said she was honored to read a proclamation from Wheeling Mayor Andy McKenzie declaring Nov. 2-8 “Apprenticeship Week” in the city of Wheeling. President Obama had proclaimed that week as the first National Apprenticeship Week, with plans for it to continue on an annual basis. Riley expressed the group’s appreciation for the mayor’s support. Facilitator for the group is Michael A. Ferrari, apprenticeship and training representative of the labor department’s Martinsburg, W.Va., office. He received thanks for his role from Dr. Carry DeAtley, vice president of academic affairs at Northern, who noted the apprenticeship programs and the community college both have the same goals, to assist skilled workers to advance their careers for the benefit of employers. Also discussed preliminarily was a proposal to offer a pre-apprenticeship program for youths in construction along with seeking membership in the Registered Apprenticeship College Consortium, a program which helps to facilitate the transfer of apprenticeship certificates towards college credit.